We’ve come a long way from our teenage years of using alien-blue blotting sheets. 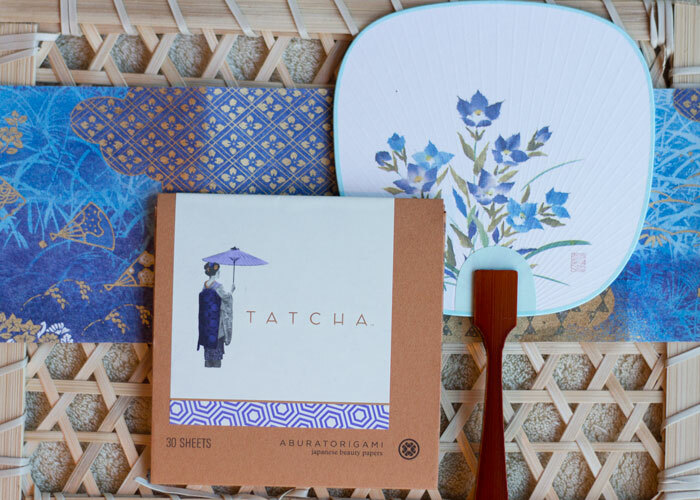 TATCHA’s Original Aburatorigami Japanese Beauty Papers make (discreetly) sopping up excess oil feel a little bit glamorous. The gorgeous, thin papers — made from abaca leaf and speckled with gold flakes — are big enough to cover my entire face (I use the front and the back of the papers) yet do not disturb my makeup. 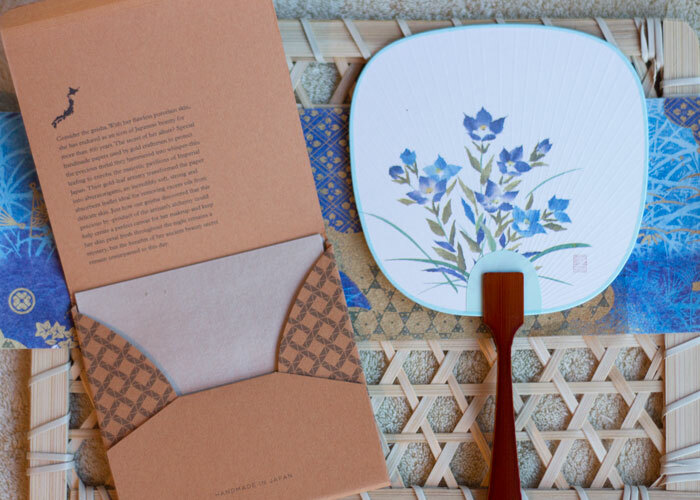 Beautifully and efficiently packaged, TATCHA’s blotting papers barely take up any space for a pack that holds 30 sheets of gold-flaked papers. I keep a packet of these papers on my desk at work and tote them with me in my bag while I’m on the go. During the workday, I tend to get shiny by mid-morning. After patting one of these papers into my skin, I’m good to go for several hours before my end-of-the-day touchup. TATCHA’s blotting papers keep your skin’s moisture (aka oil) intact while bringing down the shine factor. Think a true, dewy glow that you desire instead of a greasy, shiny face. 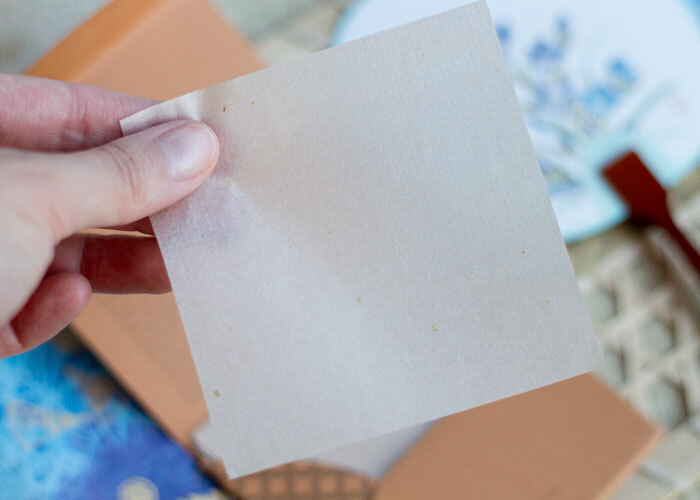 All it takes is a gentle pressing of the paper into the skin (no rubbing or moving back and forth) for the TATCHA blotting paper to soak up the shine and leave me with a satisfyingly oily paper to discard. The papers work well with cream makeup as well as naturally oily complexions like mine. Instead of reaching for your powder to constantly touch up, reach for a TATCHA blotting paper to keep your skin from looking cakey and overly made up. Just look how simple and beautiful this blotting paper is! The tiny specks on the lower left and throughout the paper are the gold flakes. Seriously, there are gold flakes in these papers. My how fancy you are! Each paper is fragrance- and powder-free and is biodegradable. I use both sides of the sheet to maximize use (and TATCHA encourages this! ), so really, I just need one sheet per day at work to touch up my face. On the go, I’m not as likely to save a sheet to use the back, but you get the idea of how you can stretch these precious blotting papers if you must. As mentioned in my caption above, I’ve already repurchased these and consider them a staple. I love that TATCHA has taken the act of de-greasing a face and remasterd it into an enjoyable, luxurious ritual. That’s just the TATCHA way. Do you use blotting papers? Have you tried anything from TATCHA? Tell me in the comments!